One random point on the map for each person within a postcode in Scotland. Voronoi polygons from the postcodes. 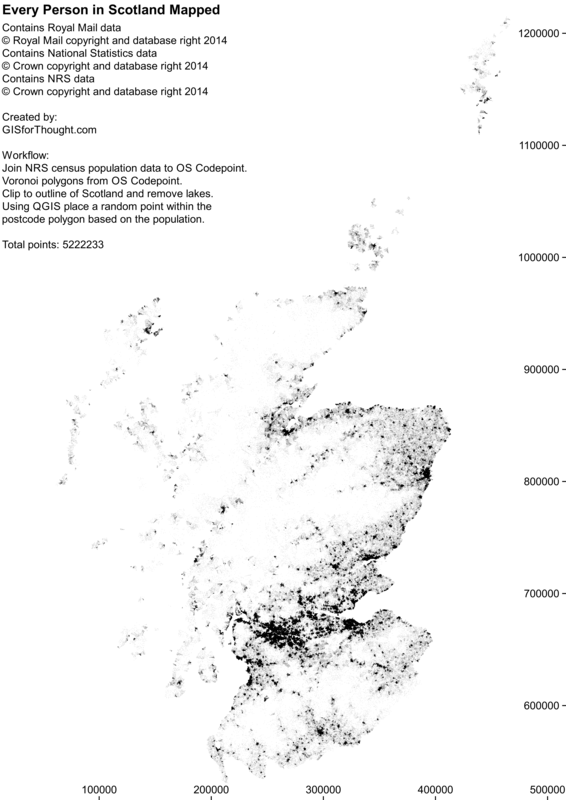 Join 2011 Scottish Census postcode population counts to Voronoi polygons. Clip the resulting polygons to the Scottish coastline (using PostGIS for time saving). Intersect the lakes out of the resulting polygons. Random point in polygon into the postcode Voronoi polygons (minus lakes), using the census counts. An easier approach would have been to use the NRS supplied postcode areas for Scotland mentioned in previous posts. A better display of this data would be through a web mapping environment, which is working on my home environment but lacking hosting. This entry was posted in All, Mapvember, QGIS, Scotland on 11/24/2014 by Heikki Vesanto.